Podiatrist Rebecca Rushton bursts the myths around treating and preventing painful foot blisters. Foot blisters can turn up just when you don’t want them – when you’re travelling, training, or trying to enjoy a nice new pair of shoes. But they don’t have to be a fact of life! Podiatrist Rebecca Rushton is a specialist in treating blisters, and in helping endurance athletes to manage their blister prevention to perform better. We sat down to ask her to share her insights into what causes blisters, and how you can plan to prevent them. Blisters are caused by the skin stretching too much. This stretching is called skin shear. When the stretching is excessive and repetitive, a tear occurs just under the skin surface. Fluid fills that area and within two hours, you’ll have what’s familiar to most of us – a blister. What don’t people understand about blisters? Well, if I asked what you think causes blisters, chances are you’d say something like heat, moisture and friction. Or poorly fitting shoes. Or something along those lines. Well firstly, there’s more to it than bad shoes. You can have perfectly fitting shoes and still get blisters. Now think about it: is it any wonder, that if we’ve got the wrong end of the stick when it comes to what causes blisters, that we find it difficult to stop blisters, or to make them feel better when we treat them. We’re focussing on the wrong thing! Once you have a blister, what’s the best way to treat it? When it comes to blister treatment, there are three types of blisters and each of them needs a slightly different kind of treatment. A blister with an intact roof, which is still holding all the blister fluid in, can't get infected if it stays like this, because the skin is keeping germs out. Dressing it – with an island dressing, like a BandAid. Reducing pressure from it – maybe with a felt donut pad or wearing shoes that don’t press on it. Reducing friction levels – perhaps changing into some dry socks or applying a lubricant to your skin or adding an Engo blister patch to your shoe. These things are going to stop the skin from stretching too much, and remember, reducing the stretching in the skin is what caused the blister in the first place. We’re trying to minimise that shear so your blister roof will remain intact and so your blister can start to heal. Use an antiseptic to kill any germs in the area. Monitor it closely for signs of infection. Ideally, keep the torn blister roof in place because that skin provides some protection to the raw blister base. If your blister roof rubs right off, you’ll be left with a red raw sore called a deroofed blister. A deroofed blister is more painful, more open to infection and takes longer to heal. The aim of treating a deroofed blister is to get good skin healing by choosing the right dressing. You need strong, flexible skin to grow back over that raw blister base. Do all the things you did for the last blister, and apply a dressing that provides a moist wound environment. You can use an island dressing like a BandAid, or a hydrocolloid dressing like Compeed. 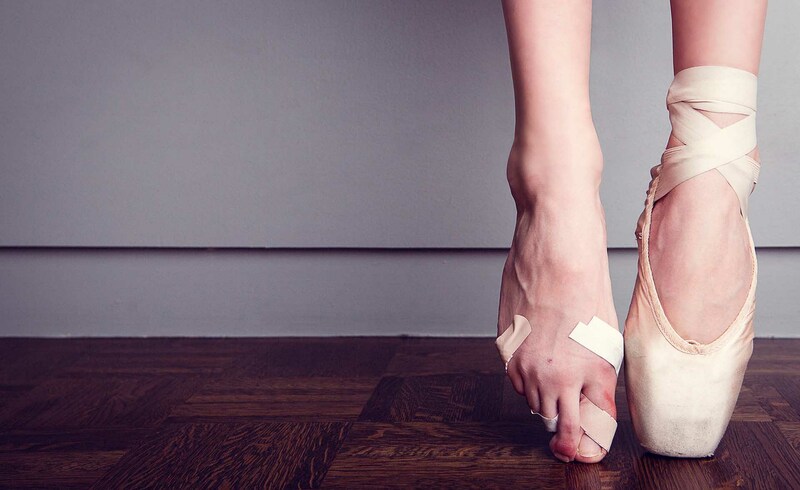 These are the only blisters you can use Compeed on. The most common mistake I see people make is ‘letting the air get to it’. If you let a deroofed blister dry out, all that will happen is you’ll get a scab over it. A scab isn’t healed skin. You’ve still got a raw blister base underneath that scab.